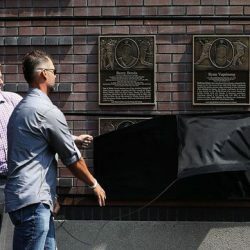 KUTZTOWN, Pa. – Kutztown University baseball alum and San Francisco Giants retiree Ryan Vogelsong was recently inducted into the Giants Wall of Fame. The ceremony took place on Saturday, July 28, before a home game against the Milwaukee Brewers at AT&T Park. A two-time World Series champion (2012, 2014) and 2011 MLB All-Star, Vogelsong pitched in the majors for 12 seasons, his last coming in 2016 with the Pittsburgh Pirates. He finished his career with 61 wins and a 4.88 ERA in 1,190 innings. Along with two stints with the Pirates, he also took the mound with the Giants for six seasons, the organization that drafted him out of Kutztown in the fifth round of the 1998 MLB draft. He made his debut with the Giants on September 2, 2000. His best season may have been in 2012, when he posted a streak of 16 consecutive quality starts, allowing three earned runs or fewer in at least six innings each game. In four starts during the 2012 postseason, he recorded a 3-0 record with a 1.09 ERA, twice helping the Giants avoid elimination en route to their 2012 World Series title. In 2014, Vogelsong made a career-high 32 starts, helping the Giants win another title. A Kutztown University pitcher from 1996-98 and a KU Athletics Hall of Famer, Vogelsong is fourth all-time at KU in wins (24) and fifth in career ERA (2.84). In 1997, he tied KU’s single-season record for wins with nine, while helping the team to the PSAC Eastern Division title, earning First Team All-PSAC East honors along the way. His junior season in 1998, Vogelsong was nearly unhittable, dealing a KU record and NCAA Division II leading 1.41 ERA. He won nine games and struck out a school-record 109 batters. That year, he was a second-team All-America selection, the North Atlantic Region Pitcher of the Year, PSAC East Player of the Year, First Team All-Region and All-PSAC East and the KU Male Athlete of the Year. In addition, Vogelsong was a career .304 hitter as a third baseman, finishing in KU’s top five all time with 73 runs batted in. The Giants Wall of Fame serves as a living tribute to the organization’s greatest players. It recognizes retired players whose records stand highest among their teammates on the basis of longevity and achievements. Those honored have played a minimum of nine season for the San Francisco Giants, or five seasons with at least one All-Star selection as a Giant. Bronze plaques honoring these players and their baseball contributions line the brick wall of AT&T Park along King Street for all Giants fans to enjoy. There are currently 49 other Giants legends who have received the Wall of Fame honor.